Politicians are in the business of persuasion, so it is always miraculous to see one succeed with an egregiously short supply of charm. It’s like the Hanukkah miracle, a menorah burning for eight days on a meager drop of oil; or, it’s like Ted Cruz conning his way onto the short list for our nation’s highest elected office despite having all the charisma of a corpse. My mind keeps circling back to this minute of Ted Cruz defending his wife from Donald Trump’s adolescent bullying tactics. How is it possible to say something so uncontroversially correct—it’s disgusting for a presumptive party nominee to attack his opponent with “your girl is ugly and mine is hot”—but make it so hard for us to agree with him? Ted Cruz comes off as an actor cast in the role of “Ted Cruz” yet still determined to tank the performance. He looks like one of those little Men in Black aliens sheltered inside a giant human suit, fiddling with levers, desperate to convincingly pass as one of us. To better understand his failings, I picked up one of those self-help books called The Charisma Myth. The thesis of the book is that charisma, though thought to be innate, can be learned through conscientious practice of specific techniques, which is a godsend for such a charm-poor pol in such a high-pressure situation. 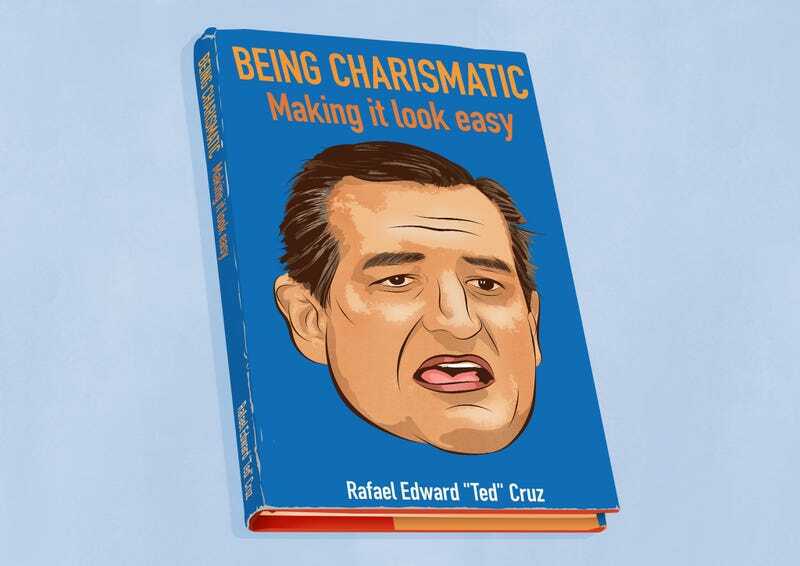 In the interest of self-improvement, let’s examine the book’s “Key Takeaways” for charismatic speaking, and use this Cruz-Trump incident as a case study in charisma, or lack thereof. “To emanate vocal power, use a slow, measured tempo; insert pauses between your sentences; and drop your intonation at the end.” Ted scores pretty highly on this measure. “It’s not easy to tick me off.” [PREGNANT PAUSE.] “I don’t get angry often.” [PREGNANT PAUSE.] But his pacing is all off from there, as he rushes through an overly rehearsed chunk of a scrapped screenplay. “People associate you with the feelings you produce in them. Avoid creating negative associations: don’t make them feel bad or wrong.” I actually feel bad criticizing him on this, because it’s an insurmountable challenge. In this video, as always, Ted Cruz makes me feel bad and wrong. “Get graphic: use pictures, metaphors, and sensory-rich language to convey a compelling, charismatic message.” “Sniveling coward” is a admirably colorful and specific imagery, great work there. I even admire Ted’s boldness in saying “hell” here, because the moment calls for (relatively) heated language. But “Ya mess with my wife, ya mess with my kids, that’ll do it every time”? C’mon guy, you are defending your wife from a crass, preteen-style attack. I want to agree with you and sympathize with you. Say something that sounds organic, and maybe even structurally imperfect—lose the pseudo-folksiness and clunky repetition. Why does even your anger feel so inauthentic? “Use as few words as possible, and deliver as much value as possible: entertainment, information, or good feelings.” He doesn’t use too many words; his message is terse, which seems apt. His task here is not to offer information or good feelings, so I can’t hold him to that standard. The result is, in a perverse way, entertaining, but for reasons he did not intend. “Never interrupt people, and occasionally pause a second or two before you answer.” Again, Cruz nails the pauses: look at him take a moment to compose himself right after wrapping up a hot ’n’ bothered rant and immediately getting the “So will you support him as the nominee?” question. He waits for two beats and shifts his weight from side to side ... before opening his mouth and losing whatever points he just gained. It comes as no surprise that he excels at the aspects of charisma that involve him not speaking or actively doing things. To emanate vocal warmth, you need to do only one thing: smile, or even just imagine smiling. Warmth. Warmth. That is what is lacking here. Has Ted Cruz ever “imagined smiling”? Have you ever imagined Ted Cruz smiling? Don’t answer that, and don’t ever do it, either.